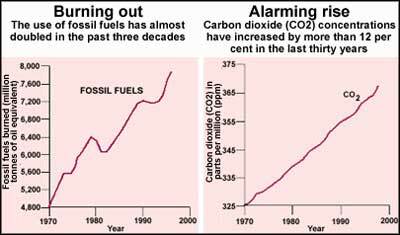 Humans have not being able to shed their reliance on fossil fuels. Every year, millions of tonnes of coal and oil is burned to produce energy. As a result, carbon locked in the Earth is being released into the atmosphere. This has led to a significant increase in the Earth's temperature. Climate scientists have warned that this increase would disrupt weather patterns. Indeed, annual damages from weather disasters have increased 40-fold. Scientists believe the only solution to this problem is to invest in non-polluting, renewable solar, wind and hydrogen energy systems.